What does the really long title mean? "Koko wa Samurai no Kuni da" basically means "This is Samurai country/land" (and it also happens to be the name of my favorite song on the OST). I fell in love with this anime/manga ever since the preview in my Monthly Shonen Jump in Janurary 2006. I'm not going to go into the detail about what it means in relation to the wall, but I can say "GO WATCH GINTAMA!1!" Anywho, this wall is completely vectored! Even my ugly rocks (which were done from scratch 'cause my internet wasn't working so I couldn't get any new stock). You can get the .PNG of the vector here @ EDD. The background swords are duplicates of Gintoki's sword 'cause I'm waaaay to lazy to vector new ones. To be honest, the background is rather empty. I couldn't think of anything that would make it seem fuller without making it too cluttered and whatnot. So any suggestions would be appreciated. Oh, and rain never falls down, it falls on an angle, so I'm not changing the rain! Texture from DA! and cloud stock from Mayang. Oh wow this is cool! Everything looks great! This makes me want to see it. Looks cool. Well anyways, Great Work! and I don't think it's empty..
j/k j/k. just nice wallie. 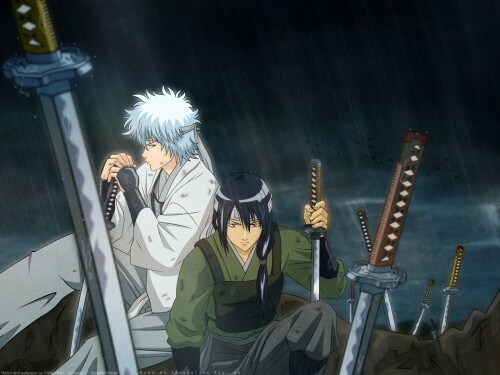 those sword give me the strong feeling.. the desire of kill some sob... maybe i need go back to see the psychology. I like the sky, and maybe you could add some blood in the sword at the very front? Domo Arigatou for the toturial desu~! I really like the subtle texture on their clothes, and even though the swords are all the same one I think that just by changing the hilt colors it makes them all seem unique. And I'm going to be a pain in the a$$ because I've seen rain fall straight down, but there was no wind. So that's just a technicality, but it does happen. ;) And this matter doesn't affect the fact that I really like the wall as is - I think the stark background adds to the desolation of the battlefield. Great job! Lovely wall chloe-chan! ^^ Vector as always is excelent, and as the whole wallpaper is vectored... everything is great! :) The background is really nice, I don't think it's too empty, I think it would be too crowed otherwise. I looove the rain :3 And the whole wall gives a sad feeling but peaceful at the same time. Really nice wall! ^^ keep it up! Nice vector also the 2 looks cool. Though I don't understand why Gintoki has so much hair, his head looks a bit deformed because of that. Don't know if you could do something for his head, if you vector him again some day. I have to say that this wall is perfect! One of the best i ever seen! Totally amazing! P.S. you have great tallent for walling and vectoring * needs to check Chloe-chan's gallery* You are totally amazing and skilled girl! P.S. 2. this is my largest comment for now..